In business, documents, decisions, and processes often need to be reliably authenticated. A (qualified) digital signature does precisely that, providing certainty that a specific individual created or edited documents or made a decision. An electronic signature is more secure than a conventional signature on paper: It can neither be copied from one document to another nor modified or forged without this being noticed. With the incorporation of qualified electronic signatures (QES) into enaio®, you can now be certain who sent a specific document and whether data has been manipulated or falsified by a third party. Audit-proof digital archiving is now just a few clicks away. enaio® makes the secure signing of digital documents a breeze. 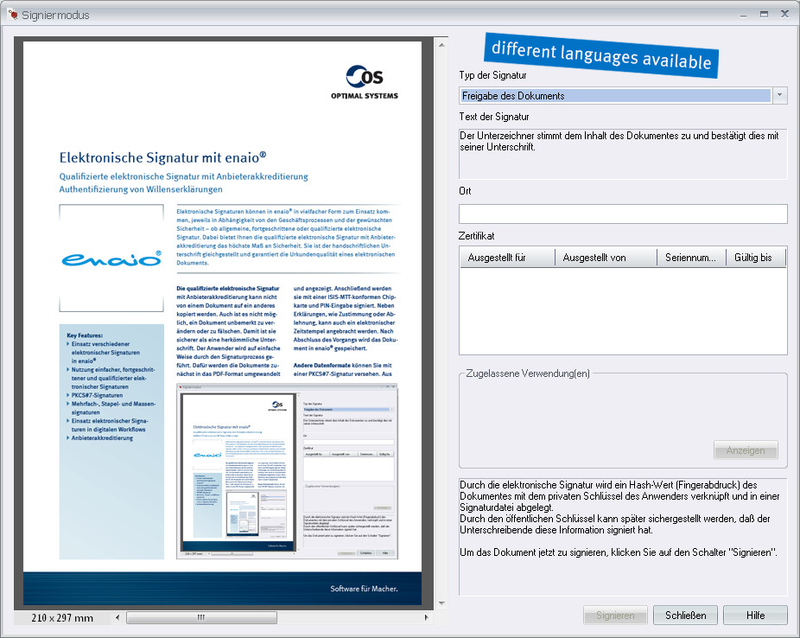 Qualified electronic signatures are especially useful in electronic workflows. They can be used to provide proof of release processes or declarations of intent at a later time. Multiple signatures are also possible for legally compliant release, approval, or notification processes. This technology is also suitable for use in quality management and for the documentation of processes in a regulated environment. All transactions are also logged in detail. You can also define rules establishing when signatures are required in enaio® administrator. This allows you to map work processes and saves employees from having to carry out time-consuming searches. Practical example: A document receives an electronic signature within a workflow process. After completing the process step, the person in charge is requested to electronically sign a log of steps taken with their signature card. The workflow file is then forwarded to the next employee. The signed log is automatically stored in a special folder in enaio® and archived in an audit-proof manner. The processes can give rise to new documents, e.g., signature lists, release documents, etc., which must be electronically signed. If a digital signature is no longer valid, this breaks the chain of protection in a document’s preservation of evidence. Electronically signed documents can then no longer be used. A useful tool here is a monitoring service, which tracks the validity of the signatures and ensures that the document is re-signed at each step in process. This is done in accordance with archiving according to TR-03138 [TR-RESISCAN] and TR-03125 [TR-ESOR], and is ArchiSafe-compliant and ArchiSig-compliant. In partnership with Mentana-Claimsoft GmbH and Governikus GmbH & Co. KG, OPTIMAL SYSTEMS has developed the enaio® besig solution, which is based on Mentana’s Hash-Safe and AutoSigner software and on the enaio® ECM software. Other signature service providers are also supported by enaio®. Contact us. Single, multiple, and batch signatures for variable use, for example, as part of release or approval workflows. Several users sign a document one after the other. It is very easy to provide an electronic signature. The detailed rights system […] ensures that clerks can only submit the declarations of consent assigned to them. The sender is authenticated based on the connection to the trust server.